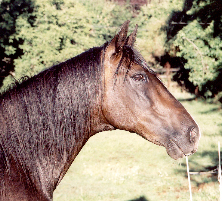 When his true nature began to appear – courageous, proud and flamboyant, graceful and gentle – we dubbed him “Senor Paso.” But when he arrived one winter midnight after a 700-mile journey, he was a frightened, confused little horse. I wanted to cover my eyes when I saw him walk. Senor Paso’s hind pastern joints were swollen and puffy and the pasterns sagged low to the ground when he put weight on his hind legs. This condition is usually diagnosed as “degenerative suspensory ligament desmitis” or DSLD, and I was told it is an irreversible, genetically-determined condition. However, I wondered why then the condition affected only his hind legs, when the anatomy of the front legs is nearly the same. Since then I have seen this condition in only the front legs, or in all four limbs, and in several breeds. The ‘genetic research’ that my vet told me about consisted only of dissection of Peruvian Pasos that had been euthanized with the condition. Senor Paso’s problems extended beyond his hind pasterns. 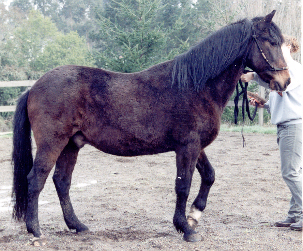 He moved his body forward with his front legs, the hind legs following when they had to, and he often stood with his hind legs at a 90 degree angle to the front ones. His back sagged weakly and the muscles throughout his body were flaccid, with pain and tension in his neck and head. He spent his time chewing on fences, or hiding in his stall. He was afraid of any request by humans and threatened by any touch. Like many “pushbutton” show horses, he had lost his ability to look forward and move toward a goal; he simply waited to be told what to do. I decided to find out what it would take to heal on all levels – body, mind, spirit – and to regain his true spirit and purpose. NOTE: It may be intimidating to read this story, with the many therapies mentioned. 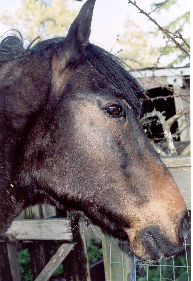 Senor Paso was in extremely poor health, and had a troubled past. He needed help on many fronts. Most horses with “DSLD” need much less therapy. I use inexpensive natural remedies, backyard herbs, and often trade for professional services, so the cost was not high. Even my time was minimal due to my other commitments. For example, I usually provided just 10 minutes of bodywork at a time, as that was all I had. Brief, more frequent sessions can be more healing than longer ones at longer intervals. Sr Paso is unable to stand still, or look at a human directly; his back and pasterns sag weakly downward. 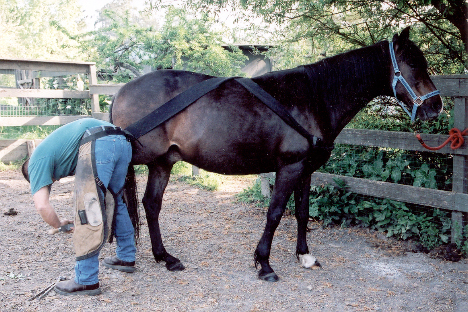 We used a low-tech, “whole horse” approach to repair Sr. Paso’s injured ligaments and tendons. To achieve lasting soundness and true healing we addressed not only the immediate symptoms, but also the underlying causes. We evaluated him from three perspectives: local (hind pasterns), regional (hindquarter system), and whole horse (body, mind and spirit). In addition to misshapen hooves, missing nutrition, dental imbalance, and other physical issues, chronic tension and anxiety can be a significant contributing factor in lameness. For this horse, light-boned conformation, extra-long pasterns and a destructive riding style also may have contributed to his breakdown. Conformation can’t be altered, but we were able to restore strength and stability to his hind legs and pastern joints, as well as healthy posture and movement to his body, and joy to his life. Sr. Paso’s “collapsing” pasterns were the end result of a body-wide process. 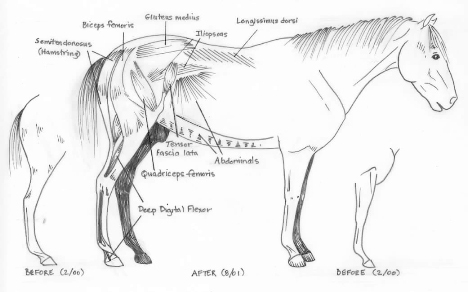 To restore soundness, we had not only to relieve inflammation and repair damage in the pasterns, but also to restore and rebalance the muscles in his back and hindquarters. compromised, the legs alone must carry all the weight and absorb all the concussion from locomotion. Exhaustion sets in. Support structures in the legs, such as the suspensory ligaments, are required to do a job they’re not designed for, and may be damaged. 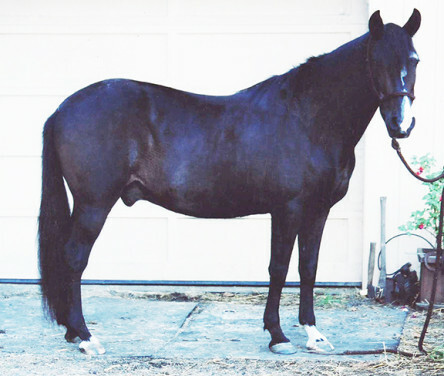 Sr. Paso had a weakened topline: an extended, upside-down neck and low,”sway” back. His hindquarters were also weak with tight muscles inside his thighs, and undeveloped ones in the croup and outer thigh. With a nearly useless Deep Digital Flexor muscle that normally flexes the pastern, the lower leg ligaments were overwhelmed with the task of supporting his fetlocks. Regular massage was a key to restoring elasticity and tone to the muscles that were either “too tight” or “too loose” in Sr. Paso’s body and legs. Massage helped clear the chronic inflammation in Sr. Paso’s lower legs, and restored circulation to the back and hip muscles. I also used more subtle techniques such as acupressure and craniosacral therapy, plus gentle stretching and joint mobilization to restore full range of motion to his hips, stifles and hocks. Other necessities for Sr. Paso’s recovery included homeopathic remedies, nutritional supplements, expert hoof trimming and therapeutic exercises. Sr Paso is wearing a “bodywrap” to help him stay calm and focused on his work: standing still, balancing his weight and allowing touch on his hindquarters. It also helps integrate his nervous system, improving his perception of his own body and his surroundings. To strengthen his muscles, we helped Sr. Paso exercise his hind limbs together with the back and neck. There’s a difference between exercises that create balance and suppleness (“active” stretching), and exercises for fitness. Challenging fitness or conditioning exercises can let already strong muscles “carry” the weak ones, but slow, deliberate movements – including various lateral movements – strengthen specific muscle groups and lead to balanced strength. Conscious passive and active movement re-integrated Sr. Paso’s nervous system, to restore his body’s ability to feel itself and relate to his surroundings, and to be in control of his movements. Gentle groundwork sessions helped him to be attentive and calm and to move forward with confidence. Relaxed trail rides and informal clinics restored his confidence and interest in life – he seemed proud of learning some simple tricks, too. The result of this integrated program: in just a few weeks Sr. Paso’s shortened, sagging neck lifted into a proud arch, his back strengthened, and his pasterns lost their swollen, congested profile. 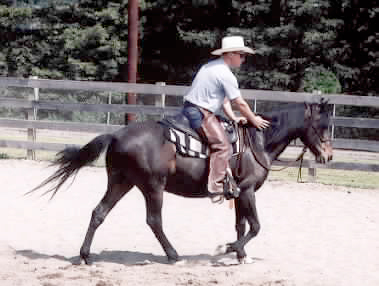 Josh Nichol on Sr. Paso during a clinic with Harry Whitney, April 2000. Good for his spirit and he should have worn pastern boots to avoid overstressing the healing tissues. When Sr. Paso arrived, the first task was to improve his body’s ability to heal. Nutritional and immune system support included probiotics, herbs and free choice minerals; a natural lifestyle; and retraining with a ‘whole horsemanship’ approach. Unbalanced hooves strain the soft tissues of the legs and make good posture difficult. Sr. Paso’s toes were long and the heels undershot, with flat soles and contracted heels. His feet were trimmed lightly but frequently in order to re-center the coffin bone and help restore normal limb biomechanics. Hindquarter weakness can often be relieved by restoring a balanced mouth and TMJ. Senor Paso’s jaws were narrow and uneven. His jaw and poll joints were tense and painful; he constantly chewed on wood. Equine dentistry relieved his symptoms and follow-up massage restored full range of motion to his head and neck. He stopped chewing on the barn and fences immediately. His extremely narrow jaw expanded significantly. 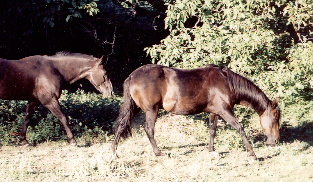 Sr. Paso went to pasture daily with socially and physically healthy horses so he could mimic their posture, mood and movement. Free exercise and grazing also provided hours of physical therapy. He experienced a variety of random sensations throughout the day, such as changes in level and surface, shifting weather, and herd dynamics, providing sophisticated neurological stimulation . He constantly performed subtle, non-repetitive movements as he changed gaits, climbed and descended slopes, and relearned independent decision making, all of which help restore sensory-motor awareness. At night or when he needed a rest day Sr. Paso had a stall with a roomy outdoor paddock, allowing him the space and time to relax and integrate the changes in his body and mind. Everyone who worked with this horse was respectful of him and of the other team members. Sr. Paso was not seen as a failure, a victim, or a patient with a terminal condition. His team believed that full recovery was possible and noticed the smallest improvement. We returned to him not only healthy legs, but a sense of self, and of belonging to a community. Sr. Paso went on to a new life. When I visited him I found a sound riding horse with a strong, balanced body and a joyous spirit. He had regained the place in the world that he was born to, as a fully functioning being.